Chinese Author, Mo Yan, Awarded 2012 Nobel Prize In Literature : The Two-Way The committee cited his deft use of "hallucinatory realism" as a means to merge past and present. Mo Yan, the Chinese author, was awarded the Nobel Prize in literature this morning. 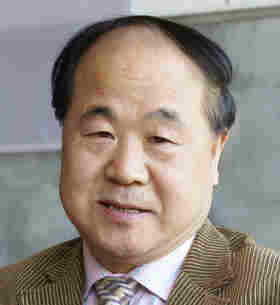 Mo Yan, the Nobel committee wrote, uses his "hallucinatory realism" to merge "folk tales, history and the contemporary." "Through a mixture of fantasy and reality, historical and social perspectives, Mo Yan has created a world reminiscent in its complexity of those in the writings of William Faulkner and Gabriel García Márquez, at the same time finding a departure point in old Chinese literature and in oral tradition," the committee explained in its citation. The 57-year-old writer is best known for his book Red Sorghum: A Novel Of China. The winner receives $1.2 million. Time Magazine has a great piece that looks at Mo Yan's life's work. Most of his literature is inspired by his hometown of Gaomi, Shandong province. And while much of it skirts the censors by taking place in the past, some of it like one of his most recent books, Frog, takes on controversial topics like China's one-child rule. As Time explains, Mo Yan works his way around the edges of government censorship by using "the adroit subtlety of his magic-realist style." "For Eric Abrahamsen, a Beijing-based translator of modern Chinese fiction, it is clear that Mo Yan engages in the complex calculus of what is and isn't permissible that faces every Chinese writer. There is nothing wrong with that: not every artist has the stomach for strident dissent and, having been banned in the past, Mo Yan has nothing to prove. But these days, says Abrahamsen, Mo Yan "knows exactly where the lines are and doesn't cross them." Discussion about the drawbacks of the one-child policy, and whether it should be rolled back, is now permissible in China, for example. "I think the reason the book got published now is because it's not controversial anymore," says Abrahamsen." According to the biography published on the Nobel website, Mo Yan, who's real name is Guan Moye, was born in 1955. "As a twelve-year-old during the Cultural Revolution he left school to work, first in agriculture, later in a factory. In 1976 he joined the People's Liberation Army and during this time began to study literature and write. His first short story was published in a literary journal in 1981. His breakthrough came a few years later with the novella Touming de hong luobo (1986, published in French as Le radis de cristal1993)."